1991 – 1994 → The Early Days. In 1991, the investigators M.J. Cooper and W.G. Stirling first requested funds from the Science and Engineering Research Council (SERC) to design and build a bending magnet beamline at the ESRF for the use of a Collaboration Research Group (CRG) of UK scientists. The beamline was to be for “Magnetic and High Resolution Diffraction”. An 18-month design study was funded and begun in March 1992: the evolution of the design considerations are described in Paul et al. Rev. Sci. Instr. 66, 1741-5, (1995). After advice from a review panel chaired by Denis McWhan, the two mirror design, which would have maximized the wave-vector resolution attainable, was rejected in favour of simpler optics consisting of a water cooled constant exit double-crystal monochromator, followed by a toroidal mirror, which provided a focal spot (1:1 focussing) at the centre of a multi-axis diffractometer. Provision was also made for unfocussed monochromatic and white beam operation. October 1994 → September 1997: The Building Phase. A grant of £1,962,350 was awarded to construct the facility in the period October 1994 – September 1997 and a Project Management Committee (PMC) was appointed by the Engineering and Physical Sciences Research Council (EPSRC) to monitor progress and also provide advice. This group, whose composition has, of course, changed over the years, continues to provide invaluable advice. Bruce Forsyth, a member of that original PMC, was the originator of the acronym ‘XMaS’ standing for X-ray Magnetic Scattering, by which BM28 is generally known. 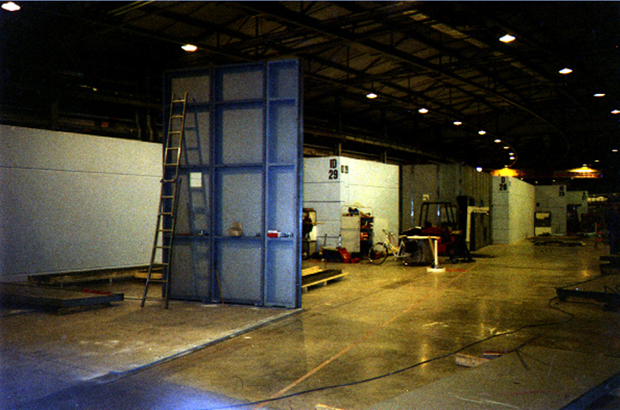 The project team, consisting of David Paul, David Laundy, Dave Bowyer, Paul Thompson and Simon Brown, moved out from the UK onto the ESRF site during the spring and summer of 1996, where they were joined by Malcolm Cooper. 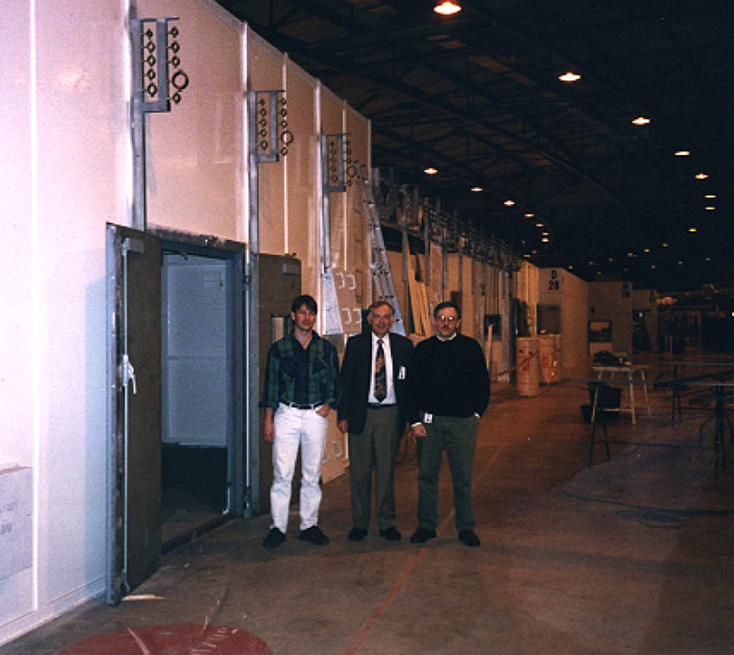 The construction project was concluded on time and within budget and the beamline was fully commissioned and ready for the first external user in April 1998, since when it has been continuously scheduled. XMaS has endeavoured to maximize user beamtime by using all synchrotron modes, for example a significant number of experiments being carried out with 16-bunch and even 4-bunch modes. • Flexible beamline 3-15 keV. • Flexible 6-circle non magnetic multi-axis diffractometer with a sphere of confusion of just 30 µm. • 10 K-300 K sample environments. • Detectors optimized for magnetic scattering. September 1997 → September 2002: Operation Phase I.
EPSRC awarded a grant of £2,627,660 to run the XMaS beamline as a user facility for a period of five years. 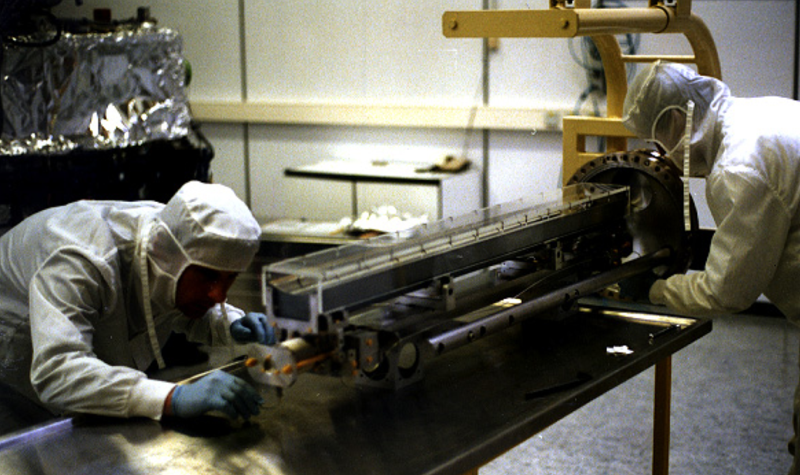 The original on-site staff consisted of two beamline scientists (Simon Brown & Anne Stunault), an engineer (David Paul) and an experimental officer (Paul Thompson), Dave Bowyer having taken a position at neighbouring ILL and David Laundy having returned to the Daresbury Laboratory in the UK. The on-site team was assisted by an administrator at Warwick (Sandra Beaufoy) and also a technician based at Liverpool (John Kervin). Early 2001, Anne Stunault left the project to take a position at the ILL and was replaced by Danny Mannix. An independent Peer Review Panel (PRP) was established to review UK beamtime proposals. In January 2001, Bill Stirling became the Director General of the ESRF and Malcolm Cooper was designated Principal Investigator with Dr Chris Lucas acting as the Liverpool co-investigator. • Two precision slit assemblies – licensed to Huber GmbH, Germany. • Motorised precision XYZ cryostat mount – licensed to Huber GmbH, Germany. • Cryogen free 4He cryostat for sub 2 K operation – developed in collaboration with ILL, Grenoble, France. • Cryostat for use with radioactive samples – developed in collaboration with ITU, Karlsruhe, Germany. • Diamond phase retarder for helicity control of the incident light. September 2002 → September 2007: Operation Phase II. A further grant of £3,420,904 by EPSRC to continue the operation of the facility was made to the Universities of Warwick and Liverpool in September 2002 and the grant was directed by Prof. Malcolm Cooper and Dr. Chris Lucas. The team also benefitted from the appointment of a third beamline scientist (Laurence Bouchenoire) in December 2002: she had worked on the beamline previously as a PhD student developing the diamond phase plate. Funding was requested and granted by EPSRC in this award for the purchase of an area detector for SAXS/WAXS developments, and for the provision of higher magnetic field sample environments. The Mar CCD detector arrived in May 2003 and the cryogen-free 4 Tesla magnet in February 2006. • Mar 165 CCD camera. • 4 Tesla superconducting magnet – licensed to AMI, USA. • Sub 1 K 3He cryostat – collaboration with ILL, Grenoble, France. • Fast helicity flipping of incident light using a phase retarder – collaboration with NPL, Teddington, UK. • Development of fast counting systems for phase retarder and lock-in detection – collaboration with NPL, UK and the Advanced Photon Source (APS), USA. • Development of E-cell and optical detection for surface studies under “real” environments. September 2007 → September 2012: Operation Phase III. In September 2007, EPSRC funded the XMaS project for a further five years with the award of £3,761,782 to the Universities of Warwick and Liverpool. A key objective of this phase of the grant was to build links with DIAMOND, the UK light source. Phase III has been marked by a number of changes in personnel: Danny Mannix left late 2007 for a scientist position at the CNRS next door to the ESRF/ILL site. He was replaced by Peter Normile who left XMaS a couple of years later for a permanent position at the University of Castilla-La Mancha (Spain). An additional four year PDRA post was created with 50% of the funding coming from DIAMOND in order to train a beamline scientist at XMaS and then transfer “know how” to DIAMOND. Oier Bikondoa occupied this post for a few months before taking over the scientist position vacated by Laurence Bouchenoire. She replaced David Paul who retired in May 2009 and became the Beamline Coordinator. Gemma Newby joined the team as the new joint PDRA. She spent the first two years of her post-doc at XMaS before moving onto DIAMOND, whilst maintaining a close relationship with the CRG. The last new face during that period was the arrival of Didier Wermeille in January 2011 as a beamline scientist replacing Peter Normile. Malcolm Cooper also officially retired from Warwick in 2010 and was replaced by his colleague Tom Hase. However, Malcolm still plays a major management role in the project. Sample environments were also developed for the application of electric fields in collaboration with the National Physical Laboratory (NPL) in the UK and the development of a liquid nitrogen cooled monochromator to replace the water–cooled version was initiated. During this phase of operation there has been a significant increase in the amount of research projects on surfaces with studies of electrochemistry and electrochemical degradation of cultural artifacts and studies of soft matter by SAXS/WAXS and grazing incidence diffraction. • Electric field capabilities between 2-300 K in a 4 Tesla field. • Enhanced performance at low energies, down to 2.4 keV. • Provision of some off-line electrical measurements (e.g. PE loops). Post September 2012: Phase IV - XMaS as an EPSRC Mid Range Facility. During the summer of 2012, EPSRC decided to continue supporting the XMaS beamline as one of its mid-range facilities, for the period 2012-18. Operation as a mid-range facility is somewhat different in that the beamline is formally required to provide a service and satisfy a number of key performance indicators (KPIs). The KPIs include expectations on the number of user shifts delivered, the papers published, the satisfaction of users with the service provided, the number of research students trained, etc..
• Operation down to 2.10 keV. • Installation of a compatible “off- line” x-ray diffraction facility with a tube source. • Completion of the cryo-monochromator project.